Remember the days when Cleethorpes dinner parties, buffets and catering in general were grim, dismal affairs to say the least? If you wanted something decent to eat then you were best staying away. It’s strange to look back at a time when food was so unadventurous and predictable…then to look at how things have changed, especially with the emerging popularity of an old favourite in hog roast. What was once dreary food, is now dreamy hog roast food in Cleethorpes. It is amazing to think just how poor catering was for these events but hog roast is certainly helping to change all that in style. Indeed, the thirty thousand plus people of this north east Lincolnshire town can look forward to many such nights in the future. The days of bad buffets for your events are over. Where you once had to put up a sad salad and lifeless sausage rolls, your guests can get stuck in to one of the tastiest catering solution around with hog roast. 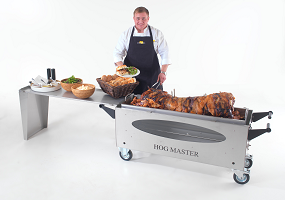 Having a hog roast at your event is often the best option for so many reasons. It is really versatile making it perfect for corporate, wedding and party functions. When you book one for your event, you know that you are not only guaranteeing great food and flavours but also something of a show for your guests. That’s because a hog roast is a bit of a visual treat with the long slow cooking process taking place for all to see on the imposing and impressive looking machine used to cook the hog, dutifully attended to by the hog roast chef. This really is something that your diners will love as it shows that you have made a great effort by booking some true fresh cooking for their dining pleasure. Hog roast catering, makes for a great wedding reception meal. If you thought it couldn’t be a formal meal then you need to think again, as it can act as the ultimate wedding reception food. It carves amazingly and, accompanied by potatoes, vegetables and the trimmings, it looks simply stunning. And what does it taste like? A hog roast is incredible. You will be that impressed by the incredible succulent flavours of the freshly roasted hog roast that you would swear that your wedding has been graced by a top chef! This is another reason why an important corporate function can benefit from the power of the hog roast. Don’t forget that these events are deal makers with important business to be discussed over good food. If you want to make a truly lasting impression then you need to push the boat out and go the whole hog with a hog roast! And with a typical pig serving anything up to one hundred and twenty diners, it really can satisfy many hungry diners without breaking the budget. Incredible flavours, an amazing fresh cooking spectacle and the perfect fine dining option. This could be just the catering answer that your event was looking for.